I’m so excited to announce the launch of a wonderful project by the talented folks of sub-studio. Yesterday they launched The Working Proof, an online print gallery and shop with the mission of promoting both art and social responsibility through a series of limited-edition prints. Prints are affordable (always under $100), and each print is paired by the artist with a charity to which we will donate 15% of each sale – creating what we believe to be a product with not just aesthetic, but social value. Each print is signed and numbered in a limited-edition print run that is exclusive to the Working Proof. 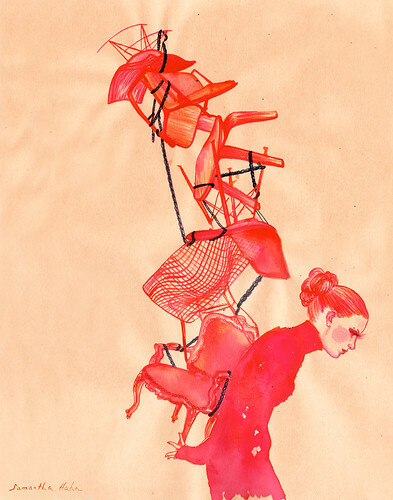 Pick up my print “Burden” above for only $45 and a donation will be made to Kids In Need. I’m so thrilled to be the first artist featured amongst some super talented peers. I can’t wait to see what Yasmine Surovec, Julianna Swaney, Heather Smith Jones, Dan Funderburgh, Gretchen Wagoner, Ben Javens, and Catherine Ryan have cooked up for this fabulous project. Each Tuesday another print will be added to the shop. Stay posted by subscribing to the newsletter. Read more about the project here and read and interview sub-studio did with me including why I chose the Kids in Need Charity here. p.s today’s my b’day and I’m having a baby in within the next 2 weeks! Your print is GORGEOUS Samantha! I’m so happy to be included in this great project too. Happy Birthday and congrats on your upcoming arrival! thanks so much Gretchen! Can’t wait to see yours. Anna and Sean are amazing and this is such a special and fantastic project! The print is a wonderful contribution to children and a lovely to look at lesson for women. Happy Birthday and best wishes on your new life coming. I will share this with my SU Fashon Illustration students where I am an adjunct and alum. wonderful Joanne, I don’t know if you saw on my profile but I’m SU alum too!! Thanks for the compliments and I hope your students like what they see.